Forget What Did: The cartoon critic. Thank you for this story, John. Somehow this particular Ross has escaped me until now. I look forward to becoming acquainted. Starting about ten years ago I've had the pleasure to enjoy people saying, "Your parents must have liked 'Friends' quite a lot." Also wanted you to know this. Lately, for reasons I can't quite identify and without any particular prompting, I find myself mumbling, "No. I am a chipmunk." This is what I like about modern social media like blogs and twitter and such. I get exposed to stuff I never knew or spent time learning before. Here, you have exposed me to the New Yorker - something I was familiar with but disliked; James Thurber who originated the scrawl-type cartoons so associated with the New Yorker and its ilk; as well as the literary term "elliptical ". I had no idea words could be elliptical outside of fancy fonts. So a-googling I a-went. Although I have read some on elliptical poetry - as apparently it mainly refers to - I still have no actual understanding of what it describes. I am aware of its existence but can not describe it or point it out in an anthology. I have researched this cartoon wondering if I am missing some bit of information that throws light as to its meaning. I have found no virtual light switch. 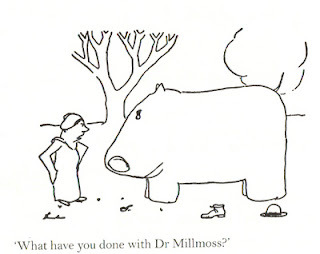 The best I have gathered is that there are some people who find it amusing that Dr. Millmoss has been eaten by a hippo. They also seem to presume that it is a Jonah in the belly of the whale situation but more cramped for poor Dr. Millmoss. And finally, given the New Yorker another look over and decided that I still am not a fan. Now this all may seem negative, but its not. The positive thing is not that I come to agree or learn something useful. The fun comes in being exposed to something worth investigating. Life can become very mundane for those of us on the average path. And it is easy to forget the thrill of the hunt of irrelevant information. Through social media I find all sorts of stuff I had no idea I didn't know. And that's what I love about it all. Clinical trials conducted by Phytopharm using 18 human volunteers revealed that the substance resulted to a decreased intake of calories per day. Check around on this site to find reliable companies with real hoodia products and also do background checks on all companies to ensure that they are selling the real deal. Hoodia, the natural enhancer of mood has several takers these days as it helps you to shed those extra pounds with out overeating.